It’s not the Fortune 500 that suffers most. It’s us. The tighter your family budget, the more you are damaged by runaway regulations that make everything more expensive. 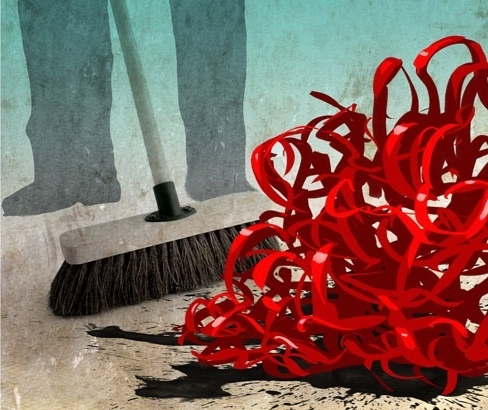 Americans for Less Regulation reveals the crippling burdens that red tape places on everyday people — burdens that need to be lowered and removed. Advocates of regulations claim that people will benefit from better goods and services, or will save money in the long run because lower operating costs eventually will repay you for higher purchase costs. Those claims are rarely true. Your savings are zero if you cannot afford the higher prices. Instead, your quality of life suffers. You also lose when you add debt to meet those prices and pay high interest rates from buying with credit cards. Sometimes the expense of red tape means you cannot get a job. Or over-regulation takes away your job. The costs of regulations reduce the self-sufficiency of Americans. Then ‘assistance’ programs are proposed to relieve the problems caused by over-regulation. That starts a new cycle of government borrowing, spending and national debt that falls on all of us and our children. Runaway regulations will never be controlled until the American public knows the personal burden on them and demands reform & relief. The biggest untold story in America is how the crushing burden of regulations hurts people, families and households far more than it hurts businesses. Companies can pass along costs of red tape through higher prices; families cannot do that. In 2014 alone, new federal regulations raised prices by $567 per person. Average households lose $15,000 yearly to higher costs caused by regulations. Federal regulations add a $1.88-trillion annual burden on the U.S. economy. Nobody can grasp that massive number, so ALR reports item-by-item specific impacts on people and households. Millions of Americans overlook their personal stake in the size of government and bureaucracy because they no longer pay federal income tax. But regulations strip them of economic freedom just as high taxes would. Quality of life suffers when government mandates raise prices, especially for those with low or limited incomes. Most advocates of reform talk about how regulations impact GDP, national employment, businesses, etc. The media likewise fail to dig deeper. But ALR focuses on how everyday people and households suffer from over-regulation. ALR boils things down to the personal level. ALR simplifies the research from groups such as The Heritage Foundation, American Enterprise Institute, Competitive Enterprise Institute, Mercatus Center, CATO Institute, the U.S. Chamber of Commerce, plus admissions by government agencies, revealing the impact on individuals and households. Only when the public feels a PERSONAL stake in reducing red tape will reform finally happen. ALR works to relieve people and families from this crushing burden of regulations and red tape. Red tape must be cut and swept away. My partner and I absolutely love your blog and find almost all of your post’s to be exactly what I’m looking for. Does one offer guest writers to write content for you personally? I wouldn’t mind publishing a post or elaborating on a few of the subjects you write concerning here. Again, awesome web log! We stumbled over here from a different page and thought I should check things out. I like what I see so now i am following you. Red tape to ban short-term loans for people in need? Quality of life suffers when government mandates raise prices, especially for those with low or limited incomes. Please be a social media supporter.